Karoo architecture is a natural outcome of building for desert conditions with few materials. The appeal remains in its simplicity and elegant pragmatism. The Eastern Cape Karoo village of Nieu-Bethesda knows how to put the fun into fracktivism. The Karoo smousing season is upon us, and Karoo Keepsakes II begins its series of launch safaris. Can the Karoo be a world centre for space tourist landings? 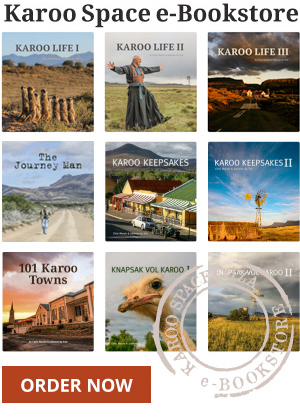 Karoo Keepsakes II makes its debut at McNaughton’s Bookshop in Graaff-Reinet. Calling all farmers! Are baboons in the Karoo showing an unhealthy interest in sheep? Can anyone help interpret these strange images?